Home » Expo » Exhibitors for Experience Your Life Expo 29th Sep 2018! Are you READY for one of the largest empowerment events in Ontario on 29th September? The first 100 attendees receive an awesome gift bag worth $40+. WELCOME to Experience Your Life Expo! This post contains important information about the schedule, arrival time and breakout sessions at the expo on 29th Sep. Please review this in detail. We are also honoured to receive greetings and support from the Prime Minister of Canada and commitment to attend from several dignitaries and public/private sector leaders. We lead with our heart and the impact of our annual event has been recognized and supported by the Prime Minister of Canada, Minister of Innovation Science and Economic Development, MP Ruby Sahota, Commanding Officer of RCMP ‘O’ Division Jennifer Strachan, MP Sven and through the physical presence of Mayor Crombie, Commanding Officer Strachan and iconic business and public sector leaders featured here. Where else can you get to have round-table career conversations with business and public sector leaders who are running thousands of people teams and organizations? See the incredible leaders who were in our breakout rooms last year business and public sector leaders featured here and we taking things to a new level in 2018. Visit the following link to see pictures and videos from the sold out 2017 event. The driving vision behind Experience Your Life is to empower people to change the lives of others. For young people seeking professional employment opportunities, travel with purpose, or professions that match their educational training, this platform aims to connect them with the right advice, organizations, employers, opportunities, and mentors. We keep the bar really high on exhibitor quality which attracts a very focused demographic of people to our event. If you are a driven and positive student, young professional who wants to pursue their professional career while making the world a better place – we are the place for you. We have been doing our event for four years now and it has been recognized at the highest levels for the very real impact it has on youths and people who are going through a career transformation. The video captures the 2016 event attended by 1800 people. 1) We are proud to have one of the LARGEST representation of federal and provincial employers in Ontario. Below is the list from 2017 and this will only grow in 2018. 2) Thousands of travel with purpose opportunities. Get PAID and see the world! 5) .We also have a “Entrepreneur Accelerator Zone” contains organizations that provide thousands of dollars in funding, grants and program as well as access to advice and mentors. 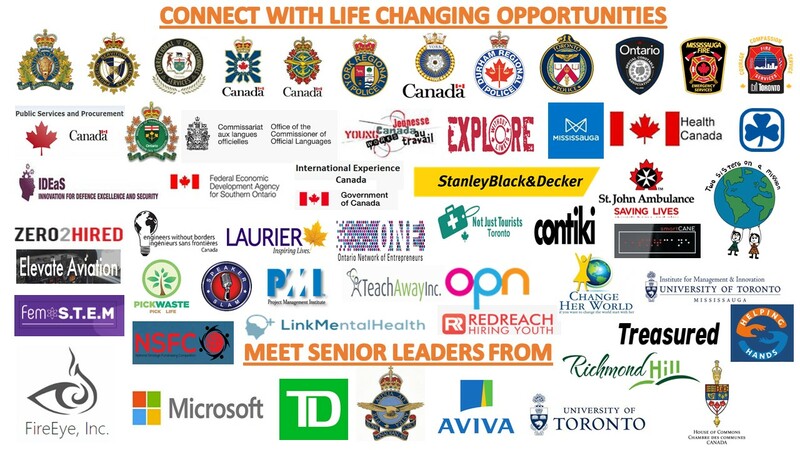 6) Our breakout rooms has senior executives from organizations like Microsoft, RCMP, Royal Canadian Air Force, FireEye, Stanley Black & Decker and many others. Visit the following post on our website. In summary, this one event could improve or change your life. We welcome positive and driven attendees who are looking for a break to truly accelerate their career. 1) Please note we are a event focused on youth empowerment and attended by senior executives from all over Canada who share our vision. Admission tickets are only for individuals seeking services of our exhibitors and absolutely no business solicitation or suit casing is permitted by non-exhibiting attendees. This policy is strictly enforced. 2) All ticket sales are non-refundable. 3) Due to the nature of the business, exhibitors or leaders may change at any point. 4) The breakout room seating is on first come and first serve basis. Registration starts at Expo opening. The breakout rooms are extremely popular and are sold out months in advance every year. 5) By taking part in this event you grant the event organisers full rights to use the images resulting from the photography/video filming, and any reproductions or adaptations of the images for fundraising, publicity or other purposes to help achieve the group’s aims without any financial compensation. This might include (but is not limited to), the right to use them in their printed and online publicity, social media, press releases and funding applications. Please like our facebook page and frequently visit the website http://www.experienceyourlife.ca for details. Please increase awareness of the Expo and your participation through your network. Let’s make a difference together ! The energy around the event is like no other and we are looking forward to share it with you.